How do you review a book to which you made a small, but full-disclosure-needed, contribution? One way might be to simply avoid reviewing the bits you contributed, so that’s what I’m going to try here. Tom Sheppard’s classic and comprehensive book on four-wheel-drive technique had its genesis in 1993 as the hard-bound The Land Rover Experience—a User’s Guide to Four-wheel Driving, sponsored by the manufacturer. I picked up a 1994 second edition, which I still own. Despite its exclusive focus on Land Rover vehicles, as an exhaustive and authoritative guide to four-wheel-drive technique in general it was like nothing I’d seen. By that time I’d owned a Land Cruiser for 15 years, had negotiated some of the most difficult trails in my region, and was using it to lead sea kayak tours to remote beaches in Mexico, yet many of the lessons—especially those dealing with driving in sand—were instantly useful. Of course 1994 was the Paleolithic in terms of four-wheel-drive technology. Electronic traction control, then a brand new feature on Range Rovers, barely merited a sixty-word paragraph. Axle differential locks weren’t mentioned (not surprising, given that Land Rover has yet—in 2016—to embrace the feature). Hill-descent control? Electronically disconnectible anti-roll bars? Not even invented yet. Flash forward to 1999, when Tom’s own nascent one-man publishing company, Desert Winds, took over production of the book, and the title was changed to Off-roader Driving and, in 2006, to Four-by-four Driving. Printing was changed to soft cover and monochrome to hold down the price, but each time the contents were thoroughly updated to explain the latest in four-wheel-drive systems and technology, until in the current, fourth edition, it takes up nearly a third of the book. Why? As Tom puts it on the back cover, “ITDS.” It’s The Driveline, Stupid. Understanding how your vehicle works—how it converts engine power into traction on the ground, or how it can fail to do so—is absolutely critical knowledge if you want to exploit its full potential. Whenever I hand someone a copy of Four-by-four Driving, I say, “Don’t skip the first two chapters!” From explaining how an open differential works to investigating the astonishing traction-control system of the $250,000 Bentley Bentayga, Tom describes each advance and feature with the thoroughness one would expect from a former RAF test pilot—not sparing the criticism where necessary. The driving sections, too, are set apart from similar books, chiefly by the overarching Golden Rule practiced by someone who has driven thousands of miles completely off-tracks in the Sahara, solo: Mechanical Sympathy. Everything from accelerating to braking is discussed with consideration for the vehicle as the number one priority. Learn the lessons here and you’ll not only be able to drive places you couldn’t before; you’ll do it with a lack of drama that will mark you as an accomplished operator. The analogy I like to use is of a pool player who has become fairly proficient at the game and shows off by slamming balls into pockets, versus the real pro who drops each ball in with a whisper, and sets his cue ball up perfectly for the next shot. Ascending and descending steep slopes, side slopes, water crossings, ice and snow, rocks, ditches—all covered. Four-by-four Driving then goes on to a discourse in vehicle recovery, and much of this section I’ll let you critique on your own since I contributed the sections on Hi-Lift jack use and winching. Sheppard, you see, mostly eschews such crutches while playing around solo in the Algerian desert. There is a further, valuable, advanced driving section, a primer on driving with trailers, and a useful introduction to expedition basics. Criticism? Okay, a small one: In the last edition of the Vehicle-dependent Expedition Guide Tom allowed me to debate his, um, stubborn adherence to tube-type tires for heavy-duty expedition use. There’s no such second opinion in Four-by-four Driving, so I’ll restate here that I believe tubeless tires have surpassed tubed equivalents for virtually all practical use. A significant majority of tire problems in the field—even in remote regions—involves simple punctures, which with a tubed tire require complete breakdown to repair. A tubeless tire can be durably fixed with a plug in a couple of minutes without even removing the wheel from the vehicle, and if more extensive work is needed a Tyreplier and a set of tire irons will facilitate everything up to and including complete removal from the wheel. Any properly equipped expedition vehicle will be carrying a compressor capable of reseating the beads, so the overall time and effort spent on tire repairs is hugely reduced. There, I did my reviewer’s duty. 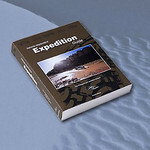 So—okay, I contributed a tiny section; yes, we sell this book on the Exploring Overland site. But Four-by-four Driving is simply too important to ignore for reasons of vested interest. If you are seriously interested in becoming a better backcountry driver, it’s a worthwhile investment. Now if you’ll excuse me, I have to go, because as I was skimming through the book to review it I found some stuff I, er, need to get caught up on. $45 well spent. Find it here. Need I add it would make an excellent Christmas Present? Bear with me for a bit? Sometime in the early 1980s I happened across an intriguing article in a U.S. four-wheel-drive magazine. In it was a photo of a fellow standing in a sandy expanse of desert, next to a very early Range Rover. A line bisected two words scrawled in the sand: ‘Mali’ and ‘Algeria.’ The fellow leaned on a shovel, apparently the tool used to scribe this middle-of-nowhere border. That was my introduction to Tom Sheppard, ex-Royal Air Force test pilot and the leader of the first west-to-east crossing of the Sahara Desert, the Joint Services Expedition, in 1975. In the years to come I followed his (frequently solo) excursions through the most isolated regions of the Algerian Sahara, often completely off-tracks. In 1999, when I heard he had published a book called Vehicle-dependent Expedition Guide that would be available at Land Rover dealers, I drove 120 miles to the swank showroom in Scottsdale, and stood in line to pay for a copy behind wealthy urbanite Range Rover buyers picking out Africa-themed spare tire covers. Fast forward eight or nine years, when I was fortunate enough to work with Tom during my time as editor of Overland Journal. A year or so later, Roseann and I had the opportunity to meet him on a trip to England. To my amazement, there was not a trace of the ex-test-pilot-Sahara-explorer-RGS-medal-winner arrogance I would have expected. Instead, we were welcomed by a quiet, humorous, and steadfastly self-effacing man who doted on the horses and sheep that grazed on the farmland adjacent to his modest cottage. Over the next few visits we became friends. Fast forward again to 2014. We’d been trying to convice Tom to publish a fourth edition of VDEG (‘veedeg,’ as he and everyone refers to Vehicle-dependent Expedition Guide). The third edition had sold out in half the time he expected. He agreed it was needed—but then sent me a mockup of the proposed cover, which (as you can see from the header image) was a complete shock. So now, after seven months of exhaustive research and writing on both Tom’s and my part, I can announce that the fourth edition of Vehicle-dependent Expedition Guide, by Tom Sheppard and Jonathan Hanson (woo hoo!) will be out in mid-May, with copies also available at the Overland Expo. This edition has received the most extensive updating and expanding since the original, with much more content specifically relevant to North American readers than in previous editions. Total content is up by nearly 20 percent—it's now a 600-page book. Any verbose attempt on my part to explain what an honor this is would be futile. So I’ll just say I’m thrilled and humbled to have contributed in a very minor way to a classic in the field of expedition literature. If you don’t yet own a copy of VDEG, or if you have previous editions and need to complete your collection, please follow this link and put your name on the waiting list. As before, VDEG 4 will be produced by Tom’s one-man publishing enterprise, Desert Winds, and quantities will be limited. It’s confirmed! The fourth edition of Tom Sheppard’s overlanding and expedition travel bible, the Vehicle-dependent Expedition Guide, is coming this spring.
. . . and more. Whether you read it end to end (a daunting task!) or refer to relevant chapters as you need them, you’ll find decades of expedition experience from which to learn. 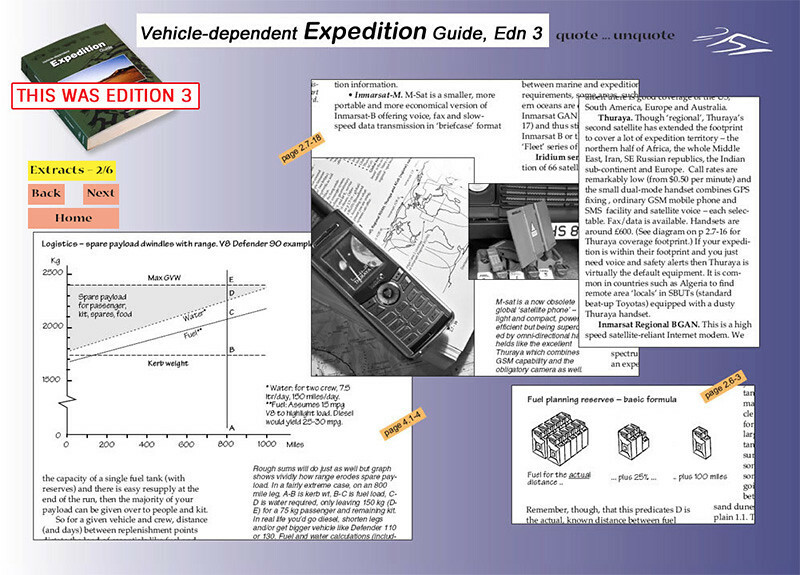 Every previous edition of Vehicle-dependent Expedition Guide has sold out, with the result that used or hoarded copies sell for far more than their original price (a fact that annoys Tom and was much of the impetus for the new effort). The fourth edition is being updated and expanded significantly, and, for the first time, extensive information relevant to North American overlanders is also incorporated. This will certainly be the most comprehensive and useful VDEG yet. However, once again the print run is limited, as Tom Sheppard runs a one-man publishing company. If you’d like to be informed when the book is out, please use this link and add your name and contact information. For more about Tom Sheppard and the detailed and majestic books he creates, check out the Desert Winds Publishing website. 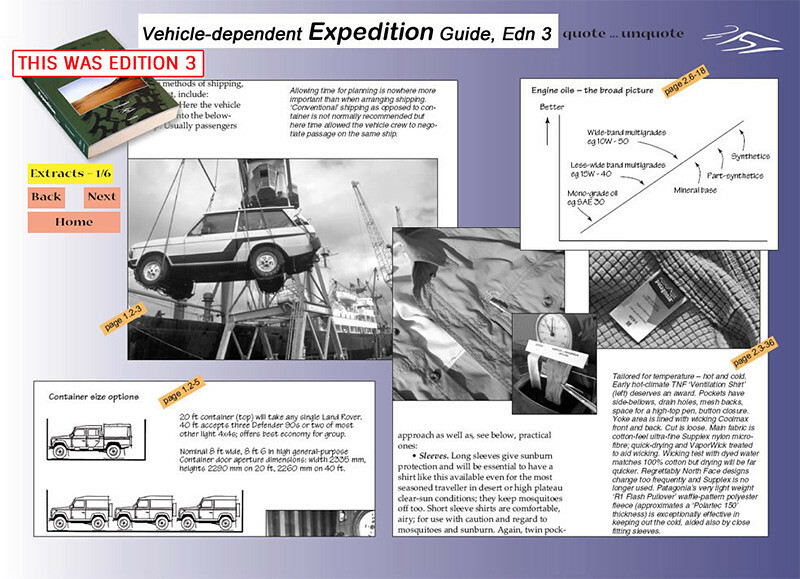 Vehicle-dependent Expedition Guide: fourth edition? I remember waiting in line to pay for my first copy of Tom Sheppard’s Vehicle-dependent Expedition Guide, at the decidedly upscale Land Rover dealership in Scottsdale, Arizona. It was 1998, the first, hardbound edition of the book had recently been released, and I’d driven 120 miles with the express purpose of securing a copy. At the counter in front of me, a woman was agonizing (trust me, that’s the right word) over whether to buy the giraffe or rhino-illustrated spare tire cover for her new Discovery II. She vacillated for at least five minutes while I flipped through the thick book, skimming Sheppard’s exhaustive sections on vehicle selection and modification, communications, loading and lashing, navigation, and team selection. I had decided I would definitely not select Disco woman for any team I led, and was about to suggest aloud that, since she had dropped $40,000 on the vehicle, why not buy both the stupid $30 tire covers, when the giraffe won out. (“He’s cuter.”) The gulf between her universe and that in the book I held could have been measured in parsecs. Back home, I discovered that within the 500-plus pages of the VDEG (say “Veedeg”if you wish to be counted among the cognoscenti) was virtually everything one might need to know to plan, organize, and conduct a vehicle-dependent expedition, whether of 100 or 10,000 miles duration. The stunning level of detail was what one would expect if the author were, say, a former test pilot for the Royal Air Force, or had, for example, led the first lateral crossing of the Sahara Desert in prototype Forward-control Land Rovers, or had driven a further several tens of thousands of miles in that same desert, much of it solo and completely off-tracks. All of which was true of Squadron Leader Tom Sheppard, whose articles I’d been reading for almost two decades. Random example from Section 2.6: two full-page spreads on engine oil characteristics, service categories, and labeling. It seemed excessive—until you realized that oil is quite literally the blood of your vehicle’s engine. There were similar in-depth investigations into wicking fabrics, camping stoves, high-frequency radios, electrical loads, water purification—on and on—plus extensive sections on shipping, 4WD systems, provisioning and cooking, and navigation. But it wasn’t all technical jargon. The book was liberally sprinkled with personal anecdotes and photos from four decades of exploration. For several weeks my writing schedule suffered as I detoured into Tom Sheppard’s world, and learned as much as I ever did from any university textbook—while having much more fun. 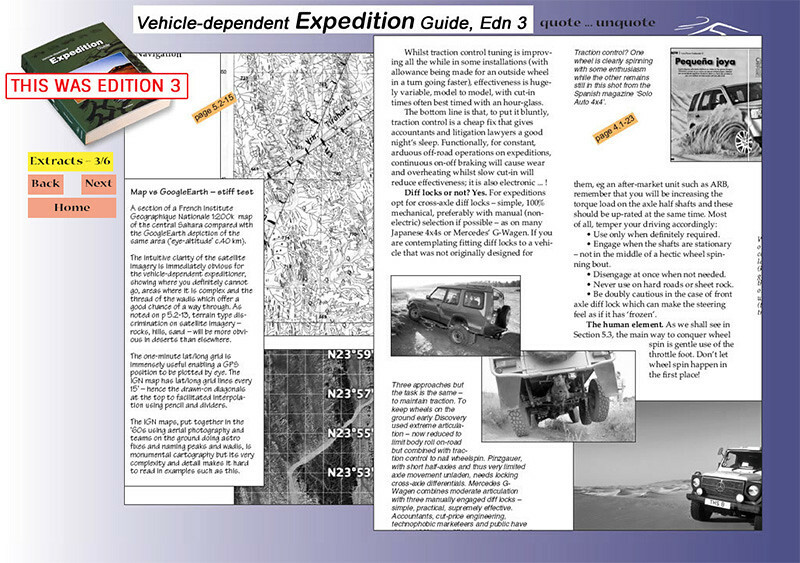 The third edition of Vehicle-dependent Expedition Guide recently sold out. Tom originally thought (swore!) it would be the last, but now he is considering a fourth edition, which would once again be thoroughly updated. If, like me, you own every previous edition, you’ll certainly want this one. If you don’t have a copy of any of them, your overlanding library is tragically incomplete. Now, here’s the thing: Whether a fourth edition comes to pass is entirely up to you. Tom is tallying the number of people on his email waiting list to determine if he can commit the substantial time and energy to another round of test-pilot-level scrutiny and revisions. You can bet I’m on the list; if you wish to be as well, send an email to him at mail@desertwinds.co.uk. Use a suitably pleading tone, but gently remind him of his duty to the worldwide overlanding community. That works really well on retired RAF squadron leaders. Desert Winds—i.e. Tom—also publishes several other books, some useful, some merely lovely. You can order them directly from him here. And an update: It seems Tom's printer found a box of VDEG ed. 3 in a corner. Available while supplies last, probably not long. Then it's on to VDEG ed.4! New VDEG imminent . . .
‘Relieved’ because the techno-gremlins chose the 11th hour to attack the layout software, calling on the true spirit, tenacity and ingenuity of overlanders to get things back on track. Desert Winds Customer Service Department (i.e. Tom Sheppard) quotes their Chief Proof Checker (i.e. Tom Sheppard) as saying, ‘Yes, quite a few of the pictures are now the right way up and most of the text has been back-translated from the Indo-Iranian zabani-tadjik calligraphy’. On stage, smartly dressed in a black turtle-neck, Desert Winds’ CEO (yes … ) thanked the small distinguished army of back-order e-mailers for their patience and asked them to keep an eye on the www.desertwinds.co.uk website which Desert Winds Webmaster (you guessed it … ) will be updating very soon." A Desert Winds spokesman, questioned by a lady with a clip-board, said, "No, the actual book won't be as large as the sheets on the table in the foreground. "Just in case you've been living under a rock in the Sahara (or are new to the overlanding world, in which case you're forgiven), Tom's Vehicle Dependent Expedition Guide is the bible of overlanding, and a copy should be in the library of anyone remotely interested in vehicle-dependent travel. It is, quite simply, superb in its authority, scope, and humor (i.e. humour), and is the standard by which all other books on the subject are and always will be judged. The fact that it can (and can only) be purchased directly from the writer/publisher/proof checker/customer-service representative is a lovely bonus in this day of Amazon.com facelessness. Of all the high-quality and/or indispensable items I try to discover and recommend on OT&T, you'll thank me for none more than this one. In case you missed the link in the text, it's available HERE. Given our remote home site, dependable well, and abundant wildlife (not to mention free-ranging cattle), we’d be in better shape to survive a bio-apocalypse than 99 percent of the U.S. population. And I feel about 99 percent better equipped to do so since my friend Bruce handed me a copy of Thomas Glover’s Pocket Ref. I’ve used various one-subject pocket references before (wiring, plumbing), but this tiny 864-page book covers an array of subjects that is simply stunning. Look through the index and pick an uncommon letter—say, W. Now pick one entry out of the 31 listed under W—say, weather. Glover’s Pocket Ref will tell you the following things about weather: Beaufort wind scale; cloud types; cold water survival time; dew points; Fujita-Pearson tornado intensity scale; heat/humidity factors; hurricane intensity scale; ice thickness safety; weather map symbols, and wind chill factors. Over in the Fs, under formulas, you’ll find a staggering 105 entries, from Ohm’s law to antenna length to load on a wire rope or sling to sound intensity to voltage drop vs. wire length, diameter, and current. Knots will still work - but better stock up on sisal rope.Other entries: knots—lots of them—treatment for a sucking chest wound; steel tubing specifications; maximum floor joist spans; simple and compound interest factors; area formulas, solvent types; and I could go on for another 863 pages. Need to calculate how much water is left in a cylindrical tank of known diameter and length? No problem. Need to know the rank of the uniformed military personnel who show up after the apocalypse to declare martial law? No problem. Do you have a hard time remembering the geologic time scale (did the Miocene or the Pliocene come first? )—no problem. I can now quickly figure the BTUs available in a cord of Douglas fir, or the clamping force possible with a 15mm 8.8 bolt, or the proper hand signals for a crane and hoist operator. Amazing. A reference book such as this shouldn’t be entertaining—its mission is to promulgate information. But it’s fascinating to simply browse through the Pocket Ref and see what you can learn. Take my advice: Buy one and just toss it in your glove box—if you come out one morning and find your tires have melted into blobs of bio-slime, you’ll be ready to face the future. If someone in the New World wants to sell you a firkin of home-brew, you'll want to know just how much that is. Available on Amazon—as long as Amazon still operates . . .